Get Ready to Go Back to School With the Lovable Little Peppa Pig! : Giveaway Opportunity! You are here: Home / Giveaways / Get Ready to Go Back to School With the Lovable Little Peppa Pig! Get Ready to Go Back to School With the Lovable Little Peppa Pig! Giveaway Opportunity! Lovable little Peppa Pig is getting ready to go back to school – and so can you– with the DVD release of Peppa Pig: School Bus Trip – available from Entertainment One! My son is a little old for Peppa Pig! But, my 4-year-old nephew loves Peppa Pig! He loved this new DVD! The colorful new title is launching as a special DVD + Scholastic Mini Book Gift Set (SRP: $19.98), and will also be available for Digital Download. And the Scholastic Mini Book included as part of the Gift Set is titled “Class Trip,” making it the perfect addition to this Peppa seasonal offering as well as a great “watch and read” opportunity for parents and kids. I watched this one and the “peppasodes” are entertaining and younger children will be delighted with Peppa Pig! I love how they are based around school. My 4-year-old nephew will be starting Pre-K and this DVD made him laugh. He is also more excited about starting school in September! Airing on Nick Jr., Peppa Pig follows the adventures of Peppa, a loveable, exuberant little piggy who lives with her brother George, Mummy Pig and Daddy Pig. Peppa Pig episodes are available on DVD, and for download on iTunes and Amazon Instant Video. 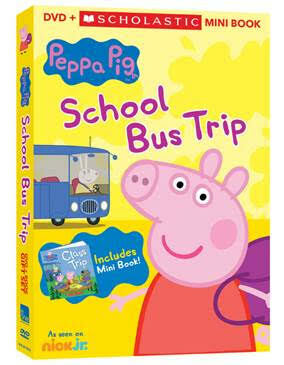 In the Peppa Pig: School Bus Trip DVD, Peppa and her school friends take a trip to the mountains, where she and her classmates have fun hearing echoes, having a picnic, and singing their favorite tune on the bus ride home – the “Bing Bong Song.” Back at school, Peppa attends gym class, acts in the school play, participates in sports day, and much more! Young viewers will love these hilarious adventures filled with lots of snorts, laughter, sunshine, and of course, jumping in muddy puddles! We have teamed up for a Back-to-School Giveaway! One winner will win this new Peppa Pig DVD! To enter, leave a comment below telling us why your younger child is looking forward to the new school year! Deadline to enter is August 25th, 2015 at noon PST. One winner will randomly be selected via Random.org. And for more information about Peppa Pig, please visit www.peppapig.com, Facebook at facebook.com/OfficialPeppaPigUS or Twitter at @PeppaPigUS. Self Disclosure: I received a free copy of the Peppa Pig: School Bus Trip DVD to facilitate this feature and a winner will receive a DVD that will be shipped to them. He is looking forward to it because he will be at the same school as big brother. she is looking forward to her new teacher! She is looking forward to using her new Peppa book bag and lunch bag. She cannot wait until the school year starts! My youngest has been loving Pepa Pig lately! With back to school she is looking forward to learning like the big kids. My daughter is looking forward to making new friends at her new school. She loves to watch Peppa pig after school.